Prince Gift Basket Discounts Apply ! 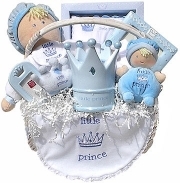 5" embroidered velour crown ring rattle that says "Little Prince" on the crown. 5" velour prince plush toy with the words "Little Prince" embroidered on his tummy. Rattles when shaken. 13" trimmed and embroidered feeder bib with satin accents and scalloped edging and the words "Little Prince" embroidered on the front. Hook and loop closure, and a blue hanger for the bib is also included. 6" x 6" embroidered and appliqued keepsake "Little Prince" pillow with satin ribbon for hanging. Blank spaces for personalization are on the front of the pillow and include places to write in the following: "Name," "Date," "Time," "Hospital," "Weight," and "Length" of baby. Fabric marker included. 2.25" x 4" ceramic baby frame with die-cut prince crown design. Glass insert and flocked backing. Holds a 1.75" x 2.5" photo. 3.5" x 3.5" x 5.5" ceramic decorative crown shape bank with jewel accents and the words "Little Prince" across the front. 5.5" x 7.75" ceramic photo frame with jeweled crown at the top and the words, "Little Prince" across the bottom. Holds a 4" x 6" photo. Glass insert and flocked backing. 100% cotton solid colored infant bib. Please note that in the event that any item is out of stock at the time of your order, we will always substitute an item that is of equal or greater value that looks equally as cute in the basket.